Professional Numismatists Guild (PNG) member-dealers have been assisting the news media in their continuing investigations of several gold-buying companies that move from community to community across the United States. 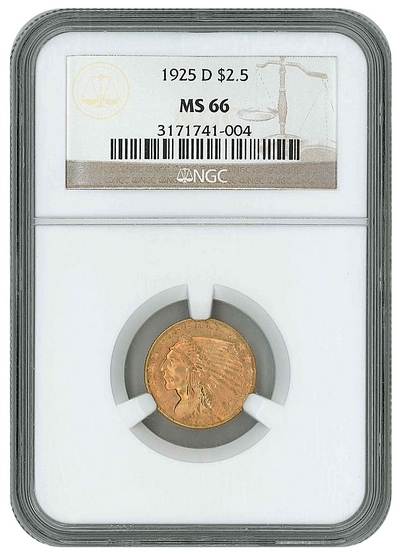 One of the buyers offered only $60 – significantly less than even its bullion melt value – for a 1925-D Indian Head $2.50 gold coin certified NGC MS66 and valued at $10,000 by PNG experts. The initial investigations were conducted by The Examiner newspaper in Beaumont, Texas of several traveling gold buying companies at hotels in Alabama, Georgia, Louisiana, Mississippi and Texas. The subsequent stories revealed that “promises of big money weren’t really true, and in many encounters the money offered was nearly a fourth or less of the actual value of the items being presented for sale,” according to Jerry Jordan, the award-winning News Editor of The Examiner. Based on the results of the investigative reporting, PNG officials issued a brief consumer advisory to the general public. “Results reported in those stories are not necessarily indicative of all hotel coin buyers across the country, but we encourage people who want to sell gold or silver to prepare in advance: know beforehand what you are selling and get more than one offer, preferably in writing. Consult with local merchants in your community who may not have flashy advertising but who may offer you considerably more money for your coins and jewelry. Members of the Professional Numismatists Guild must adhere to a strict Code of Ethics in the buying and selling of numismatic merchandise, and must refrain from buying at unreasonable prices,” advised Brueggeman. Jordan discovered some hotel buyers operate under multiple assumed names, have lawsuits filed against them and are targeting areas of the country undergoing economic distress. The investigations also revealed another potential problem for people who want to sell gold jewelry. “The scales used by some itinerant buyers to weigh gold jewelry may not even be lawfully registered with government agencies. That could result in inaccurate weight measurements to your detriment when you’re selling gold jewelry for its melt value,” said Brueggeman. During the investigations, PNG member-dealers provided Jordan with gold and silver coins valued at more than $43,000 to offer to traveling gold buying companies, and assisted the newspaper with expert opinions on what their own companies would actually pay for those items. The newspaper’s stories reported that some traveling gold buyers lure people with ads promising they’ll pay collector premiums for better dates and better grades of coins, but news media personnel weren’t even offered the scrap value for many high-grade, rate-date certified gold coins. The offers they received on most gold jewelry were way below the melt value. Editor Jordan reported that at one hotel location, “The Examiner brought in its entire supply of coins, scrap gold and bullion – valued at more than $43,000 – and was offered $11,600, or about 25 cents on the dollar.” At another location, hotel buyers offered only $680 for $25,580 worth of certified coins; only about three percent of their actual, easily determined value. Here are some examples of the numismatic items presented to three different companies during the investigation, the offers received and the actual market value of the items according to the participating PNG member-dealers on the same day the offers were made. Better numismatic dates and grades did not factor in the offers to purchase even though some hotel buyers referred to price guide books or looked up information on their laptop computers before making an offer. Editor Jordan also reported that some hotel buyers are targeting areas of the country undergoing economic distress and do not have a brick and mortar storefront presence as required by some government agencies. In addition, some traveling buyers do advertising encouraging people to mail in their gold to sell. Founded in 1955, the PNG has a strict Code of Ethics for its members in the buying and selling of numismatic items. For additional information and the locations of PNG member-dealers, call (760) 728-1300 or visit online at www.PNGdealers.com.